Rugs are always precious to their owners – whether they're family heirlooms or special pieces, picked out with time and care to add a finishing touch to a room. Here at Tri-State Carpets, we believe that every rug is special, which is why we treat every piece according to its particular circumstances. We are specialists in all kinds of rug cleaning. Whether it’s wool, silk, synthetic or Oriental, we will be able to maintain its essence, whilst still getting rid of stains, spots, and grime and bringing its brilliant colors back to life. 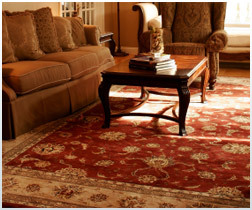 We offer a free pick-up and return delivery service, and use a step-by-step process when it comes to your rug. This includes a thorough vacuuming, washing, and grooming and then drying it in a climate-controlled room. We guarantee that by the time it's back in your hands, it will be in tip-top shape.